I have liaised with Mike 2E0YYY and Ed DD5LP on options for the next VK ZL JA - EU S2S QSO Party. We have settled on Saturday 6 April 2019, timing 06:00 UTC to 08:00 UTC. VK east coast sunset is at 07:52 UTC, with last light at 08:20 UTC. All SOTA activators and chasers, anywhere in the world, you are welcome to join in using your preferred mode, CW, SSB and digital etc… We welcome interest from BV Taiwan. It’s now time to post your alert! It’s also CT SOTA day (8 years of SOTA in Portugal). It’s on the agenda from now on. Sunrise in Bavaria - April 6th 2019 - 6:42am (local) 04:42 UTC. I will be operating only SSB on 20m plus possibly 17m and 40m for EU-EU contacts. Subject to good weather, I’m happy to stay on the summit overnight for a S2S attempt early Sunday morning (VK time) between 1900 and 2100 UTC Saturday 6 April. I will have a FT-857D and a mix of portable antennas for voice SSB. Happy to discuss about seven days out from 6 April. I will be available to Chase on this event. I will be on a rest day no shift work & will be Chasing using SSB & FT8 all bands. Bands of special interest to me are 17mtr & 15mtr if there is propagation. Thanks for organising this event. 73’ Don GW0PLP - IO72 - West Coast of Wales. Will be QRV on 20m CW and SSB, also 40, 30, and 17m. I will plan to be on a vk2 summit for the event. In the diary, should be able to make it out. Probably South Wales. You can count me in also from Arizona. I have an Ic-7000 and a 20 Amp Hour LiFePo4 to power it for SSB or FT8. Count me in, will activate DM/HE-017, probably QRP only, maybe FT8. Thanks for organising! I’m interested too. FT8 ? As is customary, I’ll have a go. Probably from G/SP-004 Shining Tor. Normally, for this event, I get quite a few emails, PM’s and a lot of questions at radio rallies about which antenna, mode, timing, etc and this year has been no exception. Last March, this event was interesting, in as much the 20m band, Long Path, had been in poor shape for some time. However, for reasons know only to the radio gods, they showed showed some mercy. There was some reasonable LP propagation between VK/G albeit a short opening. In my case, the activation was mainly S&P. In terms of numbers (just 10 contacts,) it was a poor activation, in terms of DX it wasn’t too bad. What mode do I use?.. Historically, IMHO, from a SOTA summit, G/VK has been pretty much dominated by ssb. No doubt, the data mode junkies will be throwing their hands up in horror, however, I make no apologies for saying that. 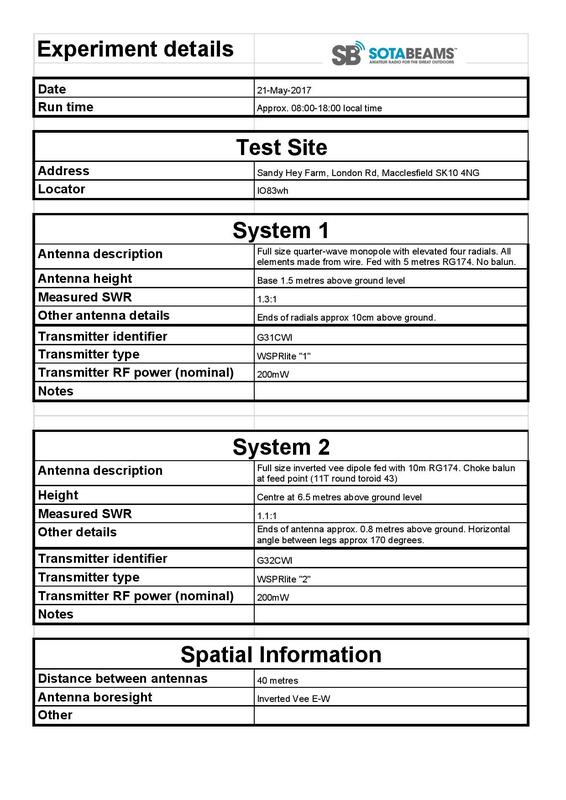 So which antenna do I use for the VK/ZL/EU/JA day? Well, for about 7 years, I’ve been totally hooked on my Antron-99 CB vertical, which has proved SOTAs most successful DX antenna by a country mile. However, about 2 months ago, I took a nasty fall and very hard landing on one of the HEMA summits, finishing up with a bad back. My enthusiasm for carrying heavy equipment suddenly waned and I changed over to my home brew inverted vee dipoles, cut for the 20, 40 and 80m bands. The weight saving was quite significant and allowed me to carry on activating. Why not a linked dipole, you ask? Well, I have a theory that a mono band inverted vee works better than a linked dipole and I plan to keep testing them for the time being. The antenna is the one piece of equipment which will make or break any DX activation and right now, I haven’t made my mind up between vertical and horizontal for the 6 April. Twelve months ago during this event, my vertical performed well and I wouldn’t entertain the idea of changing it but of course, conditions and times change. Bottom line, more work is required before I decide and I’m hoping the VK/ZL guys who have been brilliant helping with my experiments over the years, will continue to do so. Right now, I’ve still got my reservations about long path between VK and G, however, due to time differences, we’re pretty much stuck with it. Having said this, April is a fair way off and there are others who are far more qualified than me to comment on such matters. Under the conditions of this test the quarterwave monopole outperformed the inverted vee dipole and showed an advantage of just under 5 dB (data from all ranges > 100 km from test site). As we know a low dipole (in this case an inverted-V configuration) has generally a higher angle of radiation, so the vertical with the lower angle of radiation will have it’s signals hit the F2 layer at a more acute angle, meaning each “hop” will be longer, hence the finding that a vertically polarised antenna with get you more distant stations makes sense. Don’t write off the Inverted-V dipole however. I have worked EU- VK/ZL on several occasions with one. The Inverted-V is also better for closer-in stations so it has an advantage over the vertical in this respect. The verical is susceptible to vertical obstructions, such as trees and we have a lot of summits with small woods on the top of them here in DL. I have tried to use vertical antennas from some of these summits - it has never gone well, luckily I always had the Inverted-V with me as well and it often saved the day. So if you have a wide-open summit and you are looking for DX, and the propagation is there, then a vertical of some kind (J-poles pack up nicely and don’t need radials) should normally be the better choice. I’ve not had a chance to do a direct comparison between the inverted vee dipole and Antron vertical. Hopefully, if the wx is okay, I’ll try next week. Maybe attempt to work some SP DX. I think my 20m and 40m dipoles have performed reasonably well, because of the HAT I get using a 10m fishing pole. Not everyone wants to carry a 10m fishing pole up a summit and have the hassle of guying it, especially in windy conditions. I’ll be using my trusty 20m “upper and outer” I don’t do much DX operating but it seems to work well when I do as well as being quick to set up. Probably because the person most dedicated to showing the link is up is yourself, who uses SSB exclusively. If there was mainly one activator using Hellschreiber exclusively and a chaser population to support it, it’d probably dominate too. Thank you for planning. I posted my alert will activate JA/HG-052 on 20m FT8 and CW. I am looking forward to working with overseas summits.